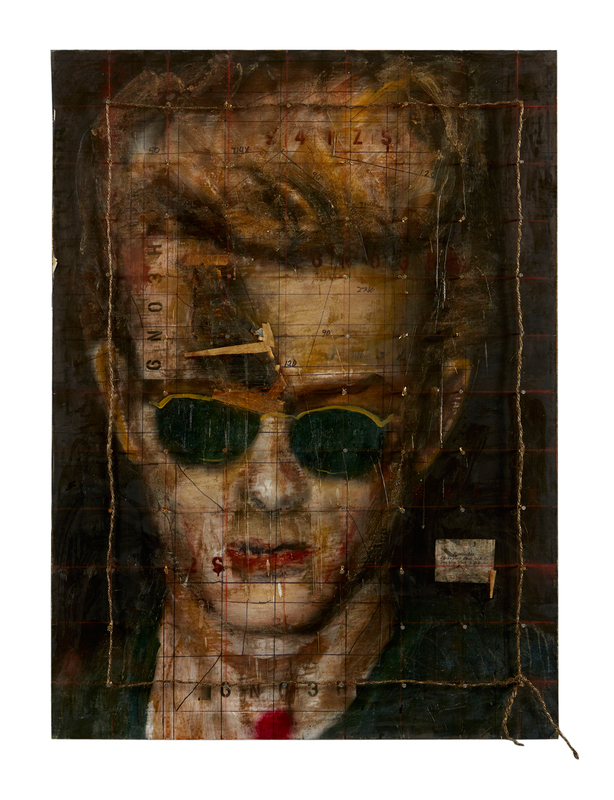 A portrait of James Dean studded with a grid of nails. An early lyric from Bob Dylan painted into a composition with a mirrored background. A wall-sized assemblage of images and found objects including an old washboard and a child’s boot. These were among the visual intrigues that greeted visitors to the ACA Galleries in Manhattan for Life, Death, Love and Freedom, the exhibit borrowing the title of Mellencamp’s 2008 album. As Mellencamp mingled, he chose not to address the crowd. But when the ACA Galleries presented his first New York show in 2015, he told Billboard he had begun painting as a child and it was even "more natural" to him than making music. "I wanted to study at the Art Students League in New York when I was young," he said at the time, "but I didn’t have the money. Then I was fortunate enough to become Johnny Cougar Mellencamp. At the time, I thought I’d make a couple of records and get back to painting. It never dawned on my that I’d be [in my 60s] and still making music." Mellencamp, 66, has charted 22 Top 40 hits on the Billboard Hot 100, and has sold 13.3 million albums in the U.S., according to Nielsen Music, since the Nielsen era began in 1991. On June 15, he will be welcomed into the Songwriters Hall of Fame, inducted by Nora Guthrie, daughter of Woody, who was among the gallery guests Wednesday evening. Others present included actor Meg Ryan; Mellencamp’s manager, Randy Hoffman; former MTV Networks chairman/ CEO Tom Freston; John Sykes, president of entertainment enterprises, iHeartMedia; Universal Music Enterprises ­president/CEO Bruce Resnikoff, president/CEO of Universal Music Enterprises; and Monte and Avery Lipman, founder/chairman and founder/president, respectively, of Republic Records, which released Mellencamp’s most recent album, Sad Clowns and Hillbillies, in 2017. 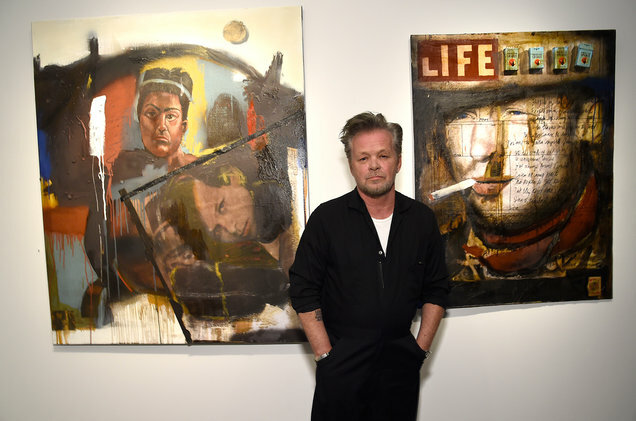 Mellencamp’s songs have often focused on economic, racial and social injustice, so his choice of the ACA Galleries to showcase his work is deliberate. Founded in New York in 1932, the gallery hosted the first meetings of the American Artists Congress, which advocated for federal programs to fund public art projects through the Great Depression. "We’ve always been a home for a art with a message," says gallery curator Mikaela Sardo Lamarche, who noted that Mellencamp’s work is "a contemporary version of what we’ve been doing all along. The politics are very much in line with ours." One recent painting, "Easy Target," shares a theme and a title with a 2017 single from Mellencamp, dominated by an image of Martin Luther King, Jr. next to a rusted key like one used for a jail cell. Another work, "Courage," shows a collection of portraits with text reading: "Courage is when you know you are licked. So you start it anyway and see it through to the end." Before Wednesday’s private reception began, Lamarche offered Billboard comments on a few of Mellencamp’s latest works. "A Bed of Nails" (2017) "Bed Of Nails" is the name of Mellencamp’s portrait of James Dean, a fellow native of Indiana. "It has this great texture," says Lamarche. "It’s all about the way the light falls. When I saw the work in the studio, it was in natural light, and as the day went on, the shadows [of the nails] change from dawn to dusk." 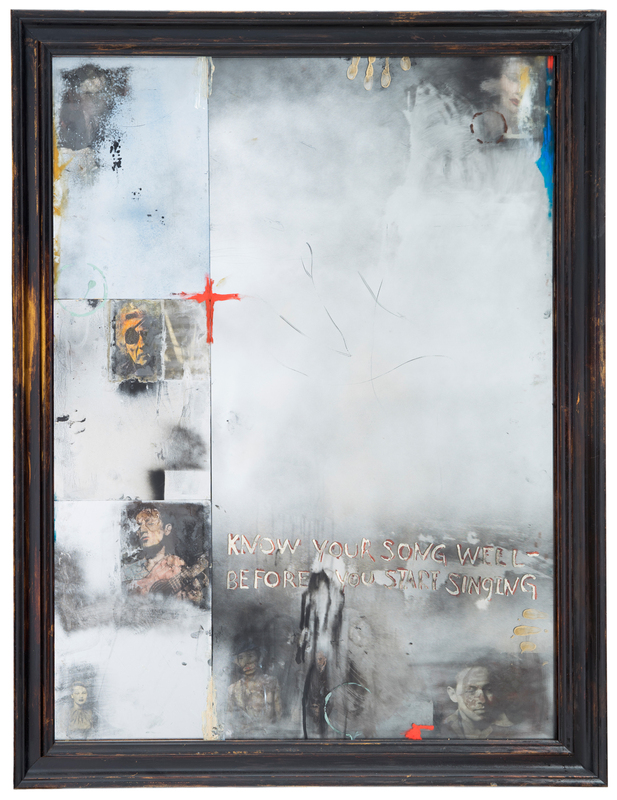 "Know Your Song Well" (2017) A mirrored collage, "Know Your Song Well," takes its title from a lyric that Mellencamp worked into the image, which comes from Bob Dylan’s "A Hard Rain’s A-Gonna Fall." Lamarche pointed out the images of individuals depicted: Woody Guthrie, a young Tennessee Williams, Orson Welles, Rebel Without A Cause director Nicholas Ray "and Barbara Stanwyck hiding over there as well." Mellencamp’s mirrored image "speaks to his demands on the viewer that they participate in the painting; you’re reflected, so you become part of it." The wall-sized work called "Monstrosity," says Lamarche, "is really incredible because it incorporates these found materials" that Mellencamp finds on his property in Indiana. 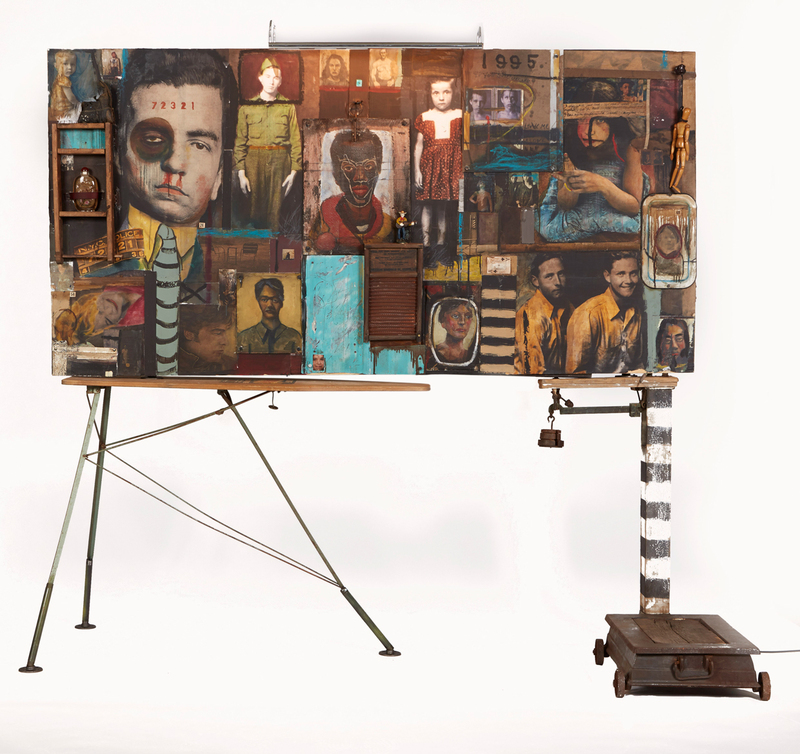 An old washboard, a vintage wooden ironing board (that supports the work), old hinges and more are mixed with images of people -- some identifiable, others not. John Mellencamp, "Monstrosity" (2017) Courtesy of John Mellencamp John Mellencamp, "Monstrosity" (2017) there’s a subtlety to much of Mellencamp’s artwork, that’s not true of a large piece dominating one wall in the gallery. It shows a man, grotesquely sprawled on his side, blood-red paint pouring from his chest. "So This Is Gun Control" reads text at the top of the painting. "The Second Amendment In Action" scrolls at the bottom of the image. John Mellencamp, "Gun Control"(2013) Courtesy of John Mellencamp John Mellencamp, "Gun Control" (2013) "It’s right in your face," says Lamarche. "It’s so timely." 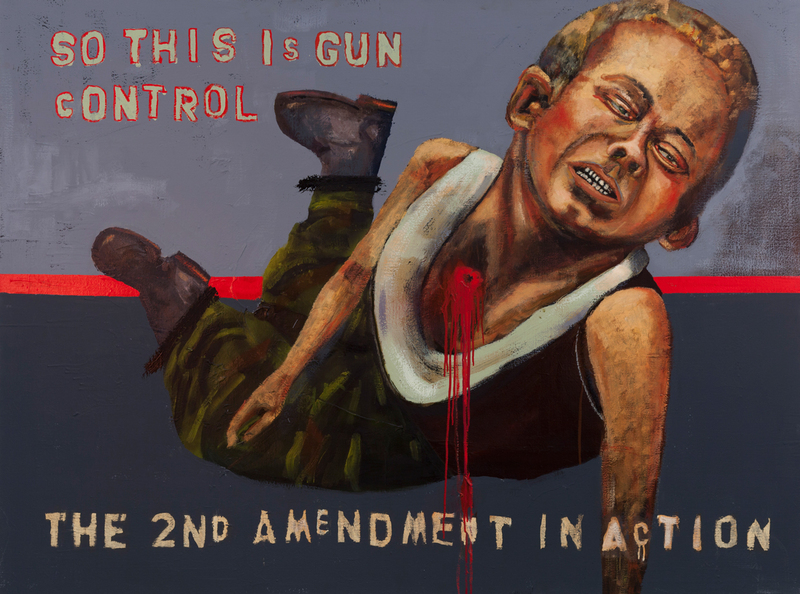 The gallery has presented "Gun Control" with others that emphasize its theme. "A Drawer Full of Bullets" is a wooden tray filled with shotgun shells and a pair of handcuffs. "The Prayer" shows a woman with eyes closed, along with the a plea: "Oh Lord Can We Please Stop Now." Mellencamp’s paintings, says Lamarche, reflect "the idea that viewer is not a passive viewer. It’s the same with his music. You’re not a passive listener. There is a real strong relationship to all of his art, the narrative qualities, the lyrical qualities, the tragedy of oppression and all the things that we continue to deal with." Life, Death, Love and Freedom is on exhibit at the ACA Galleries through June 2.